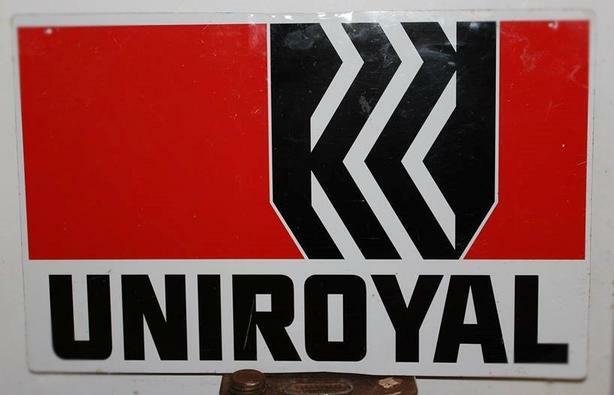 Vintage 1970's Uniroyal Tires (14 X 22" Inch) Metal Sign. From the Uniroyal Tire Company. This is a vintage sign from the 1970's for collectible purposes or display. Very good condition. There are some scratches and some scuff marks on the front of the sign. There is also some very minor creasing around the edges. Overall excellent condition. Very clean & displayable. Colours are vibrant and the sign is glossy and shiny. Good addition to any vintage sign collection. Measures approx- 14" inches in height, 22" inches in length. No maker's mark. This item can be shipped at your convenience. Please e-mail for a shipping quote. FAST SHIPPING, RELIABLE PACKAGING. PLEASE TAKE A LOOK AT MY OTHER LISTINGS! JUST CLICK "VIEW SELLER'S LIST" AT THE TOP RIGHT SIDE OF THE SCREEN! LOTS OF VINTAGE SIGNS!